The roller skating rink is very much the same with the flashing lights, pumping music, concession stand, arcade, lockers and a friendly staff. But it’s even better, maybe because it stood the test of time. How many places in the Finger Lakes have been in business for sixty-five years? Mike and Ellen Ferro have poured their heart and soul into this business and it shows. Everyone there is having so much fun. I watched as a young boy celebrated his birthday with family and friends. 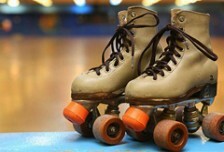 Ellen said that three-year-old toddlers skate as well as one ninety-year-old gentleman who skates once a week. Ellen talked me into lacing up. I got some women’s skates and got out on the floor a bit nervous. Even though I have not skated in twenty-five years, I did fine. I went around three times and didn’t stumble. However, I will admit that one time I had to smack my palms on a wall to stop. Hey, stopping was never my specialty. I so much enjoyed feeling the vibration under my feet, and seeing the lights reflected on the polished wooden floor. There are snacks galore—pizza, cotton candy, hot dogs, corn dogs, nachos­ ­- all reasonably priced plus vending machines, an arcade, lockers to stash your belongings, and booths to sit and sip some soda while watching colorful lights, and smiles on faces flying by. This is one place in the Finger Lakes where groups (schools, boy/girl scouts) flock from Syracuse to Marcellus, Cato, North Rose, Wolcott, Moravia, Groton, and even Penn Yan. Mark these dates on your calendar now: The City of Auburn Recreation Department sponsors FREE admission for skaters (rental skates are only $2) from 6-8 PM on 12/27/12, 2/21/13, and 4/4/13. And Reva Rolls for Rotary will happen on Wednesday, December 26, 2013 from 6-8 PM. The cost is $4/admission and the money raised is for its Youth Exchange Program. This is truly a lifetime activity. What are you waiting for? Even if stopping isn’t your forte, roller skating is always fun.